MSR is generally known for quality gear and aftermarket parts for off-road riding. 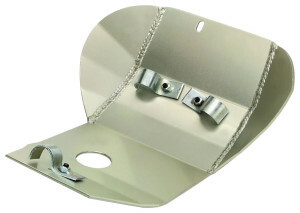 Their version of the enduro-style skid plate is similar to their competitor's models: thick aircraft-quality aluminum, a cut-out for the oil drain plug, all the requisite bumps and bulges to get around the shape of your frame and lower cases, and either drilled bolt holes or frame-clamps for mounting. The main plate is brake-press formed, while the "wings" (or side pieces) are TIG-welded in place. These are strong enough to grind over rocks and logs without much damage. They'll scratch up a little, but bending or denting these things usually requires some extraordinary punishment -- this being the point of installing one in the first place. This MSR Skid Plate is available for many models of Honda, Kawasaki, Suzuki, Yamaha, and KTM off-road bikes. And for clutch repair, check out this Barnett Performance Clutch Kit.